You and your body are inseparable. In this human life, your body is your vehicle and your relationship with it lasts longer than any other. From your first breath to your last, nothing happens to you without your body, and every experience leaves energetic tracks in it. For optimum functioning and true healing, you have to address both the physical and emotional components of every wound, injury, disease, and illness. You are worth it. Make the investment in yourself. 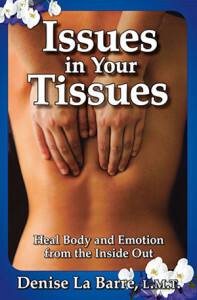 Take the time to read Issues in Your Tissues. Make time in your schedule to go inside and heal the issues in your tissues. It’s definitely possible – and simpler than you might think. 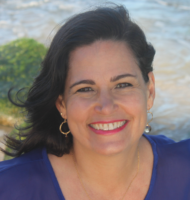 Denise’s book shows you exactly how to begin your healing journey. Here, at Healing Catalyst, you will find the perfect blend of physical and emotional in one healing approach. 3. by coming for private session work with Denise in person. Follow-up support by Skype is now available for long-distance clients. It deserves your attention and the time and money it takes to repair wounding and keep it in great condition. How much time, money and energy do you spend maintaining your car? your home? your job? You will have your body with you longer than any of those. It’s not rocket science, but it does take some understanding of the way body, mind, and emotion work together to find the right pieces for your healing puzzle. That’s exactly what Issues in Your Tissues and private sessions aim to do – Give you the experience of connecting the dots for yourself. Our work at Healing Catalyst aims for the complete functioning of your body-mind-emotional vehicle. You can ignore, abuse, and ill-treat your body for only so long before it starts to call in the debt. We all have emotional wounds, scars, dents in the pipes (so to speak) and you work around them. Imagine how much better you would feel, function, and enjoy with the kinks un-kinked and the held places released.